MONTPELLIER OUT-HALF Frans Steyn has failed in his effort to appeal the four-week ban for a dangerous tackle on Jonathan Sexton. 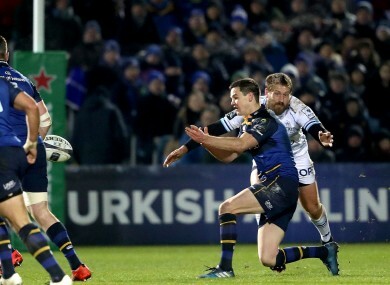 The Springbok was issued a red card in the first half of Leinster’s Champions Cup win over Montpellier in January and was banned by a disciplinary committee the following week. Two weeks into the ban, today’s appeal committee hearing was chaired by Rod McKenzie (Scotland) and heard submissions by phone from Steyn as well as Montpellier’s legal representative Christian Chevalier and club chief executive, Mathieu Charpentier. However, the committee decided to uphold the original punishment handed down to Steyn. No further punishment was added after the appeal, so Steyn will remain suspended for Montpellier’s Top 14 matches against Toulouse and Lyon before becoming eligible to play again on 6 March. Email “Steyn appeal against ban for high hit on Sexton turned down”. Feedback on “Steyn appeal against ban for high hit on Sexton turned down”.